Wonder why traders struggle to trade the markets? Why is it so hard to prepare for the next trading day? Is it the amount of information that a trader needs to pay attention to? Some of the common reasons for this problem are looking for certainty in the markets fascinated by terms like success ratio, hit ratio. Desperately trying to predict the future and actually believing that predicting the future is possible. Trust me, friends, this does not work! But there is a solution to this problem and that is who focus on what is happening in the markets in the present moment in the now. And the solution is the market profile. Market Profile is a tool which can be used to monitor the market as it develops in real time trade by trade. It is not possible to predict the market? But you can respond to it creatively and intelligently using market profile. That way trading won't be stressful anymore. So here is the solution I propose, the daily preparation schedule as shared in my market profile course. Let's go through the list one by one. Now yesterday does not mean just the previous trading day, but what it did in the recent past. We have to look at the last few days as to what the market was trying to do. Where the markets open in relation to previous day makes all the difference in the world. Let's look at some examples. This is the banknifty chart. I want to focus your attention on this open, this is the 11th of March. And on the next day, on the 12th of March. Now what these both instances tell us is that the markets are opening outside of previous days range. So you can see that there is a nice gap when it opens like this was here and then on the next day when markets open outside of Previous days Range, what it tells us is that the buyers are in control of the markets and they want to push the price is higher. That is why they have rejected prior day's range and they are going to explore new price levels to the upside. So let's look at an example of how after opening, what market does gives us some deeper insights into the markets. So just look at this example. This is a nice one. You can see that the markets open here. Then they quickly go down. They tried to enter the prior day's range. This was yesterday's high. They tried to enter yesterday's range. But they get rejected equally quickly. This type of opening is called us open test drive and what it means is that markets tested yesterday's range. They did not find any acceptance there and that's why they were pushed out of yesterdays range and that means that the trend is still strong. Buyers are going to explore higher prices, same here. In this case, we cannot even come close to yesterday's high. We just explore a few ticks lower and then immediately start moving up. All of these are signs of strong open and opening types. Once again, let's look at some examples. Day in question is this one that is the 14th of March. And what happens is once again this is the prior day's high, this is open, we open higher. But as you can see in A period itself we come back down inside the prior day's range and one more important thing is the B period does not move higher. Instead, it again comes back down inside the prior day's range. 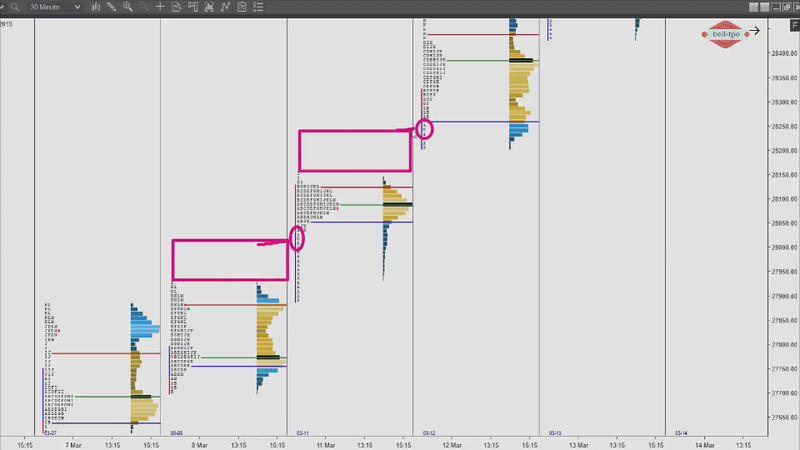 We are getting a lot of acceptance near yesterday's high and what it tells us is that the buyers may not be very keen on extending the range today. In fact, what they might do is they might end up balancing around this reference, catch their breath and maybe the next day they will try to push the prices higher. Now, this is the classic sequence of balance imbalance and balance that keeps happening in the market all the time. So first we had this big imbalance. Now we are looking at a bigger balance and probably once it is done and as it was proved on the 15th we again got an imbalance. So this is the kind of development that keeps going on in the markets and what the day is going to develop like, the signs are revealed early on in the day. This whole inability of the markets to move away from yesterday's high told us that they might actually end up moving sideways. Okay, so this is the 15th and what you can see here is that even though the open was inside yesterday's range markets did not spend any time wasting near yesterday's range. It drove out of that and then it just basically kept going on up and up in the rest of the day. 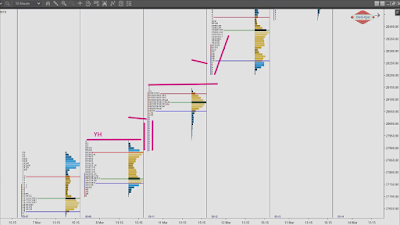 So this is how open type opening type and early market development can tell us what the day type is going to be, what the traders are trying to do in the markets. Now I have shared five core principles and three smart money objectives in my market profile course. These core principles help you apply Auction Market Theory principles to the real-time market development, they are extremely helpful and they can help you. Make sense of the most confusing market action at any given point in time. You have to find the correct core principle that is in play at any given point in the markets. Step 6: What is smart money trying to do? And once you have figured out all the five things, what you're going to do then is to figure out what the smart money is trying to do. As I said, I have shared, three smart money objectives, the smart money is trying to do either of those three things in the market at any given point in time. So the first five points will help you figure it out. What does smart money is trying to do? Now Once you figured out what the smart money is trying to do, what is left for you is to match your trade timing to them. So let's see how we can do that. Once you are sure what the smart money is trying to do the next step is to prepare a list of expected and unexpected behaviours. Let's say the market gaps up, right? The trend is up. 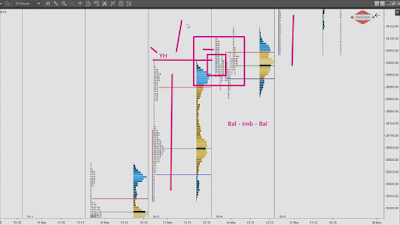 They expected behaviour is obviously for the buyers explore higher to seek higher prices, but at the same time, unexpected behaviour is for the buyers to just move sideways in a narrow range or just immediately reverse and come back inside yesterday's range, right? So you need to be prepared with both the circumstances, just focusing on one expected behaviour. Will leave you exposed to when the markets try to do something else and the markets will do what they want to do, they are not going to do what you want them to, right? So you need to be prepared with multiple outcomes, multiple scenarios so that whatever is playing in the markets, you can use your preparation as a benchmark and take appropriate action. Once you have those expected and unexpected behaviours marked on the chart or inside your mind, what do you have to do is then to wait patiently for a low-risk trading opportunity? 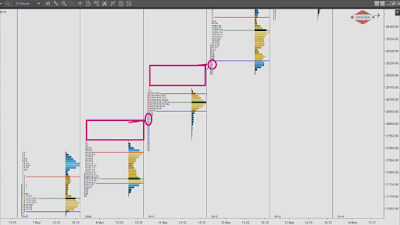 That is where order flow charts, VSA charts of some price action patterns come really handy. 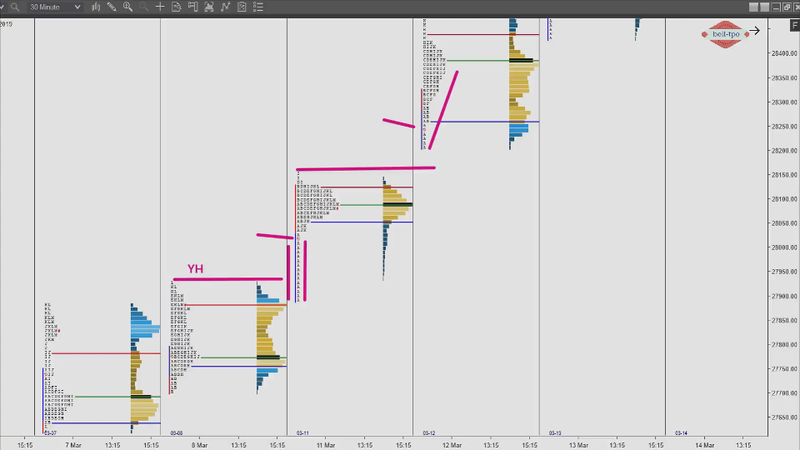 What they do is once I find a good trade idea from the market profile charts, I then move on to the order flow charts and track the market development closely near important references. 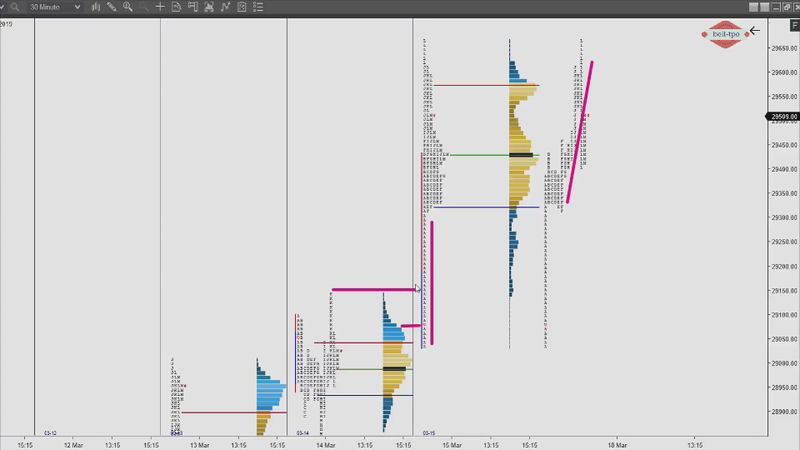 So let's say market profile has given me some reference where I can expect the buyers to come in. What I will do is I will then walk through the order flow chart or VSA chart and then I will look for some good trade setups, maybe a Delta divergence, maybe trapped buyers or sellers based on the context to enter my position at the best possible price where the risk is the least. It makes sense. So that was a step number eight. And the last step is just to repeat from step number four step number 8, multiple times throughout the day until you find the good trading opportunity and you can find a good place to enter by looking at order flow or VSA charts where the risk is minimal and that makes so much sense, doesn't it? One trap I fell into time and again when I was just becoming good with the Market profile is to fall into my old habits. I tried looking for trade setups, predicting day types and using, you know, relying on some arcane rules pertaining to market profile like the 80% rule or the often misinterpreted failed auction. 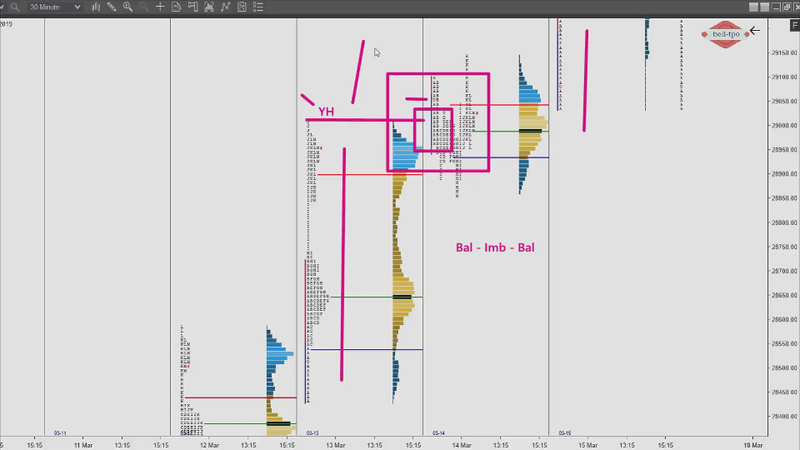 I tried to superimpose my old habits onto market profile and I realized that there was something missing in my way of analysis. But I at the same time I also realize that there was a lot of potential in this particular tool. So what I did was I took a leap of faith. I said I'll have to leave whatever I have learned so far, I have to trust myself. 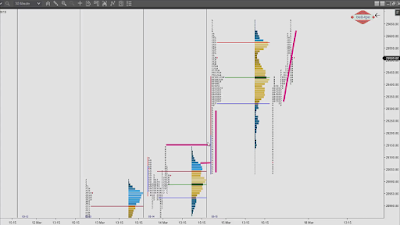 I have to trust the market profile and then start using only market profile for a while. So I left everything I used to rely on Elliot wave, technical analysis price action, indicators so many things, but I just left them all and I just focused on the market profile. I took that leap of faith, and the reason I did it was that time and tide wait for none. So you have to be very, very careful with what you do with your time. And money can come back, but time does not. So I say you stop wasting time because the time, to commit is right now don't take half measures. If you want your dreams to come true, just take that leap. Once you start figuring out markets using market profile, you will feel that you have discovered a superpower. You will start feeling invincible. And that is precisely when traders can fall into their old habits. Have anyone who felt like if you have, let me know if your experience just types it in the comments from the let me know how you started doing well, but then again fell back into your old habits. But there is no need to worry as the recovery in these stages is often swift because once you taste success with the market profile, you will never want to go back to your old habits again. Step number one is you start with looking at what happened yesterday or in the recent past. Step number two is you track the open where the market is opening in relation to the previous day. Step number three is you track the opening. Step number four is you go for analyzing what the early market development is in relation to the prior day in relation to open in relation to the opening. Step number five is to out which core principle is at play. Step number six is to figure out based on the top five steps, what does smart money is trying to do at this particular moment. Step number seven is to prepare a set of expected and unexpected behaviours which you can use as a benchmark when you start trading. Step number eight is to look for a low-risk entry point into the market and for that purpose you can use order flow charts or VSA charts. Step number nine is to just keep repeating step four to step eight multiple times in the course of the day till you find good trade opportunity. and knowing what the smart money is trying to do at any given point in time and then trying to match your trade timing with them. Trust me guys, this can change your trading forever!